One-step lateral flow immunoassay device for the qualitative and simultaneous detection of seven (7) drugs Amphetamines (AMP), Benzodiazepines (BZO), Cocaine (COC), Marijuana (THC), Methamphetamines (MET), Opiates (OPI) and their metabolites in human oral fluid, plus Alcohol. 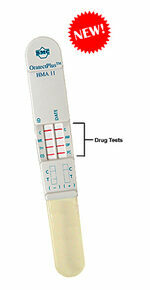 Oratect® Oral Fluid Drug Screen Device was developed to detect active drugs-of-abuse present in oral fluid. It is a one-step lateral flow immunoassay device for the qualitative detection of drugs of abuse. The device will indicate if the sample is negative or presumptive positive. If the test is presumptive positive, further testing is indicated. Easy to use, Oratect® Plus can be performed on-site and provides immediate answers. Oratect® Plus is a one-step process. There is no sample handling or any instrumentation required. It is easy to monitor and does not require gender based observation. If there is a presumptive positive result, confirmation can be performed on the same sample. Oral fluid will provide immediate information about the drug status of the subject. Results will show up in the oral fluidmore rapidly than other samples such as urine. The test provides a rapid on-site result. When a subject tests presumptive positive for a particular drug, there is no band at the drug line. Please note that the control band must be present for the test to be valid.